Modern European genetic structure demonstrates strong correlations with geography, while genetic analysis of prehistoric humans has indicated at least two major waves of immigration from outside the continent during periods of cultural change. However, population-level genome data that could shed light on the demographic processes occurring during the intervening periods have been absent. Therefore, we generated genomic data from 41 individuals dating mostly to the late 5th/early 6th century AD from present-day Bavaria in southern Germany, including 11 whole genomes (mean depth 5.56×). In addition we developed a capture array to sequence neutral regions spanning a total of 5 Mb and 486 functional polymorphic sites to high depth (mean 72×) in all individuals. Our data indicate that while men generally had ancestry that closely resembles modern northern and central Europeans, women exhibit a very high genetic heterogeneity; this includes signals of genetic ancestry ranging from western Europe to East Asia. 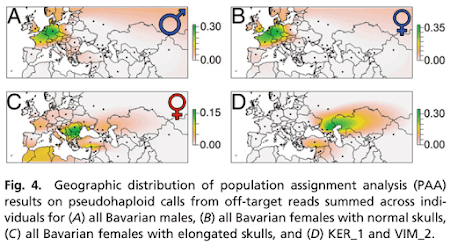 Particularly striking are women with artificial skull deformations; the analysis of their collective genetic ancestry suggests an origin in southeastern Europe. In addition, functional variants indicate that they also differed in visible characteristics. 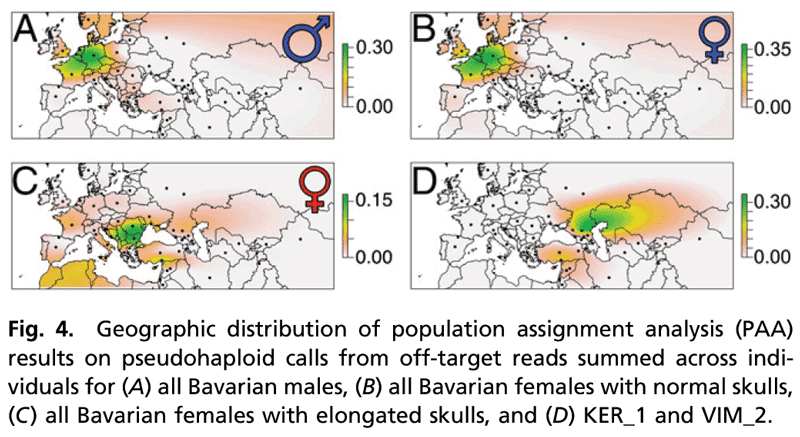 This example of female-biased migration indicates that complex demographic processes during the Early Medieval period may have contributed in an unexpected way to shape the modern European genetic landscape. Examination of the panel of functional loci also revealed that many alleles associated with recent positive selection were already at modern-like frequencies in European populations ∼1,500 years ago. A much more diverse ancestry was observed among the females with elongated skulls, as demonstrated by a significantly greater group-based FIS (SI Appendix, Fig. S35). All these females had varying amounts of genetic ancestry found today predominantly in southern European countries [as seen by the varying amounts of ancestry inferred by model-based clustering that is representative of a sample from modern Tuscany, Italy (TSI), Fig. 3], and while the majority of samples were found to be closest to modern southeastern Europeans (Bulgaria and Romania, Fig. 4C), at least one individual, AED_1108, appeared to possess ∼20% East Asian ancestry (Fig. 3), which was also evident from the high number of haplotypes within the 5-Mb neutralome that were private to modern East Asian 1000 Genomes individuals (EAS), while also demonstrating an overall ancestry profile consistent with Central Asian populations (SI Appendix, Fig. S33). No modern European individual from the Simons Genome Diversity Panel (SGDP) (11) showed any evidence of significant East Asian ancestry except one Hungarian individual with less than 5%. A higher amount of East Asian ancestry was inferred for AED_1108 than all modern Caucasus and Middle Eastern individuals, and 28 of 33 South Asian individuals. So the first East Germanics to be sampled cluster with Turks and Kazakhs. Who would've thunk it? With all of the migrations, regroupings, and assimilation, it wouldn't surprise me that some Hunnic, Avar, or other Easter-Nomad women were taken as brides, especially if their husbands wanted to claim some of their heritage. I remember reading that the main language of the Huns was actually Gothic, which seems to have been spoken by all their tribal groups. Those samples, KER_1 (Ostrogothic) and VIM_2 (Gepid), don't resemble Sarmatians. They're more southern and their Asian admixture is higher and different. Sample FN_2 is a ROman solider dating 300 AD. His DNA should be interesting. Should be first insight into ancient Romans & Central Italians at that time. "Based on an analysis of patterns of haplotype sharing, the Roman soldier (FN_2: 11.08×) was found to have substantially more southern European, West Asian, and Middle Eastern ancestry than two normal-skulled Early Medieval Bavarians with high genomic coverage"
PR_4 and PR_10 very precise matches to Tajikistan with high probability (p70, S31). (Nogai and Tuscany aren't exactly "nation states" but I'm struggling with what else the acronym could be). The Nogai esque Gepid makes sense - "Hun brides" I guess, as Rob says. KER_1 looks more like a North Caucasian than Turkish or Tuscan in the PCA (S13 / S14 / S17). S17 which has a certain kind of West Eurasian zoom places him parallel to Adygei and Chechens, but somewhat more removed to the "West" - the probability above pretty weak for the sample, which might come from being a more unusual mixture relative to present? Some kind of North Caucasus ancestry? Does it seem likely Crimea was dominated by North Caucasus types at this time in history? It seems obvious that, at least by the time of these samples, the East Germanic groups had well practiced exogamy outside their group, and as traveling males who didn't move with females and joined confederacies of fairly diverse groups that might be exactly as expected? The Roman soldier looks "west" beyond the limits of present day Spaniards as well, on those PCAs, which is an odd one. Perhaps there was a bit more homogenisation from the Roman Era than we thought? (Or I'm going a bit further on noisy data than I should ;) ). The greatest surprise: no Slavic wives. Good summary Matt. As the story goes - the Gepids were inheritors of the Hun empire. So as Attila's sons were being beheaded or (?) fleeing back east, the Gepids might have married into the Hun nobiliatas as a means of legitimizing a link to the Past. W.r.t. the Roman soldier, it would be more interesting for them to sample the limitanei from late 4th century from the very same Bavarian forts - as they would already have Germanic admixture in them, guessing from arcaheology, but might be a different kind of "Germanic' (Gothic-Gepid) than the proto-Bavarian males (middle Elbe , Thuringian). Lastly, the Roman solider might be more western than current west Europeans because of possible appreciable Germanic admixture in modern Spaniards and French. Ergo this is probably our first window into the impact of migration period on the West. What, no Y chromosome data for the males? Did they not sequence it for WGSs, or is this being reserved for another study? David, will you analyze the Lengyel samples from the Polish Neolithic Genomes Project? Quit provoking Rob. Enough already with the same discussions over and over. Only when the genotype data become available. These samples are probably a lot like GAC anyways. Yeah, I think this PCA is noisier than we're used to, so it's best not to delve too deeply into small differences on it. He doesn't really look statistically different to modern-day Spaniards in those 2 dimensions as it is. The question is whether the Roman soldier was of local origins, from Northern Italy/Gaul or from Illyria. I'm leaning less towards the last because I'd expect Anatolia_BA ancestry to have been widespread and elevated in the Balkans by this time, but perhaps there was variation in that shift. This aside, Illyrians were a**kickers and hands-down the toughest soldiers of the Roman army, deployed against Sassanian cavalry and Pictish raiders alike ;-). If he was a typical South German local of Celtic origins(result of Beakers, Unetice, etc. homogenizing with local EEF "survivors" over time), then I guess Germanic migrations resulted in massive population replacement, after all. Alas, stranger things have happened. Northern Italian or Transalpine Gaulish origins are also plausible. He clusters like those 2 or 3 locals from Colegno described in the Lombard paper. The Global25 datasheets have now been updated with the following samples from this paper. What are your thoughts on supervised ADMIXTURE based on modern Pops for these kind of studies ? I guess the classic Yamnaya / WHG/ ANF wouldn't be instructive, and there aren;t many Iron Age data to model on. So it's understandable, but at face value at least it seems funny in some choices (e.g. Fins). The supervised strategy isn't a bad one, but it looks like they're just basing their run on the 1000 Genomes dataset, probably because it has the most markers available. The obvious problem with the 1000 Genomes is that it's very limited in the number of populations it offers. So that, for instance, Finns are basically a stand in for the diversity in half of Europe, which isn't very useful. The Roman soldier has similar ancient ancestry ratios to modern Spain & Northern Italy. His WHG is higher than both, more similar to Basque. The paper says his closest affinities are to Spain & Southern France. Btw, Southern French cluster with Basque. One of the foreigners in the Bavaria burial. But this one didn't have an elongated skull. Odd ancient ancestry makeup. Maybe DNA coverage is low. Kind of looks like a mix of Beaker Sicily and something with Yamnaya ancestry. ALso, sort of similar to Mycenean ancient ancestry proporions. This doesn't make sense. Not like modern Romanian even though population assinight analysis put it with with Bulgaria/Romania. If anything, looks like a European/Cypriot or European/Anatolian mix. Elongaded skulls are commonly found in Northern Gaul and all parts of Roman Empire where germans emigrated. Just a quick note (if you're still there sam, or any other person): first thing to do maybe is to give the list of closest populations, which is always automatically outputted on nMonte. Just set input list as all samples, and ncycles as 1 (or any other super low number, will return in seconds). Just to get a general sense of where in the cloud of West Eurasians the sample lies, before we start modelling in earnest, as that would help us pick sources as well. Yeah, to get a gist, I just get the closest 8 distances and terminate the program. What's the command for setting the cycle number, though? Thanks in advance. This might help for the outliers: the usual PCA of West Eurasia. All of these samples had enough markers to be positioned correctly in this PCA, so there's nothing weird going on, this is what they really are. The Crimean Goths vary craniometrically a lot from the other Goths and Germanics. Among other things they were brachycephalic. Which made it clear decades ago that there was something exotic going on about them. Nice to see this confirmed here. But these were not ancestral to the Goths that migrated further west and invaded the Roman empire, they stayed there on the Crimea. And the Roman soldier from 300 AD could be anything, because from 212 AD onwards practically all free inhabitants of the Roman Empire had the Roman citizenship. So no way can we say he must be typical for Iron Age central Italians, let alone Latins. But these results are interesting, they make sense of the strong Southeast European and slight East Asian admixture in my 3/4 Swabian 1/4 Swiss grandmother. Serbia Gepid looks fairly close to modern Serbian in its position, barring East Asian admixture. Some formula like 0.2 East Asian (not sure which) + 0.3 Germanic + 0.5 Serb might fit him OK. If I had to guess a mix for the Crimean Goth, and we had to fix part of his ancestry in Germany/Scandinavia, I'd estimate about 1/3 ScandoGerman: 1/3 South Caucasian. (Though likely it would have to be more complex). I was expecting a North Caucasus+other mix for Crimea, so perhaps this is very tentative evidence for a much more South Caucasus like (e.g. CHG like), North Caucasus in the past, and gene flow from the steppe has been relatively more important there than I have considered? Or something else? FN_2 does look a little bit more "north" and "west" than any Italian population, even Bergamo, closer to modern Spaniards; this may well just mean that he was from Spain though. The Medieval "Germans" are harder for me to make sense of. 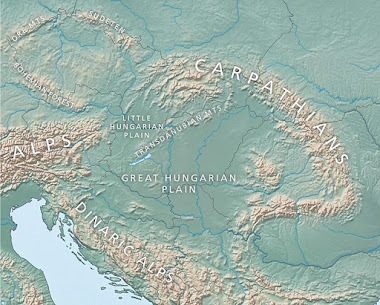 The Artificial Cranial Deformation (ACD) samples do indeed look very Southeast European, or more precisely at the modern day intersect of Central Europe-North Balkans. While the normal Germans look, well, normally German/Austrian. ACD sample AED_1108 look like he/she has a very decidely East European, push, and is a bit of an outlier. Looking forward to seeing those Sarmatians; the Crimean Goth was as Turkish like here (closest modern neighbour, though somewhat distant still), so I'm guess those Sarmatians will be similarly accurately proxied by Tajiks. Speaking in terms of everyday culture, narratives of Attila's Huns are more or less still omnipresent in German culture. As someone who is partly Bavarian, I would say some Bavarians would be flattered to have one of Attila’s Huns in there lineage. Though looking at some more dimensions, Crimean Goth probably needs some modern Iranian like and East Asian as well, as the CHG affinity relative to Iran_N+East Asia looks too weak to fit with a purely South Caucasian+Germanic mix. Hunnish admixture in Gepids totally makes sense, historically speaking. Ardaric was one of Attila's most trusted generals, together with Valamir. So you can bet the alliance between Gepids and Huns was cemented with marriages. These samples are probably a lot like GAC anyways. "With all of the migrations, regroupings, and assimilation, it wouldn't surprise me that some Hunnic, Avar, or other Easter-Nomad women were taken as brides, especially if their husbands wanted to claim some of their heritage." Who knows. Maybe heritage was a secondary reason the Germanic tribes refused to live under Attila's sons as vassals. They might have considered themselves heirs of Attila's empire. Haha, was going to say that you'd be pleased with this paper as it seems to provide an elegant, if unexpected, explanation for your findings. It also explains the "Balkanic traits" in Bavarians that phenoforums people discuss non-stop. I'd be curious to see new results for her using either the German outlier300 or sample 535(both being SE shifted). Post if/when you can/are inclined to. Tomorrow, I'll be posting some modern Balkaner models using these samples. Spoiler: Yup, Albanians seem to get a sizeable Slavic input roughly commensurate w/R1a+I2aDin and Slavic lexicon there. Oh, take note of Italian_Abruzzo! Haven't tested my theory of it being Levant-poor(relative to Italy_South) yet, but it's not a bad input pop for Balkaners like I previously surmised. "I remember reading that the main language of the Huns was actually Gothic, which seems to have been spoken by all their tribal groups." " As I waited and walked up and down in front of the enclosure which surrounded the house, a man, whom from his Scythian dress I took for a barbarian, came up and addressed me in Greek, with the word Xaire, "Hail!" I was surprised at a Scythian speaking Greek. For the subjects of the Huns, swept together from various lands, speak, besides their own barbarous tongues, either Hunnic or Gothic, or--as many as have commercial dealings with the western Romans--Latin; but none of them easily speak Greek, except captives from the Thracian or Illyrian sea-coast; and these last are easily known to any stranger by their torn garments and the squalor of their heads, as men who have met with a reverse." The Sarmatians from this paper don't have enough markers to bother with. But they're Sarmatians from Pokrovka. And there already are Sarmatians from Pokrovka in the Global25 datasheets. My close cousin (23andMe) who shares my maternal grandfather's English surname is 1/2 English , 1/2 German (Thuringian). She has mtDNA D4j and still 0.1 East Asian ancestry. Now I know why. This paper doesn't seem to mention it, but the Thuringii also are reported to have (Hunnic?) females with elongated skulls, and also, at times, alliances with the Huns. Hunnic elite were Turkic but lingua franca is unknown. @Davidski; True, I'd thought these were late Sarmatians from a similar period to the other samples, but they're just from the same era as Unterlander's paper (much less interesting... which feels odd to say, but is true). Anthro said: "Oh, take note of Italian_Abruzzo! Haven't tested my theory of it being Levant-poor(relative to Italy_South) yet, but it's not a bad input pop for Balkaners like I previously surmised." It does seem to have lower Levant-like stuff compared to Italy_South (=Calabria?) but still higher than the Balkans. Than contemporary Balkaners or ancient Balkan samples? The former have a considerable "trans-Danubian" superstrate(mostly Slavic) upwards of 30-60%. Their reduced Anatolia_BA fraction may correspond to reduced Levant affinity relative to Abruzzo. Both (if anything the ancient Balkan samples had less of it compared to at least some areas like the Aegean or deep southern Greece). And I don't think the Caucasus/Levant ratio in Anatolia_BA can wholly explain what we see in Italy, at least south of Tuscany. You likely need Levant/North African type of stuff. I've played with ancient and modern Balkan genomes in Global25 quite a bit. The (increased) affinity to Baltic_BA in the moderns is obvious (with an interesting apparent split between Balkan Slavs and Albanians and Greeks in that sort of ancestry) but it doesn't seem to explain the other post-ancient? stuff at least South Italy has that's lacking in the Balkans. Well, it's true that southern Italy was more cosmopolitan than Moesia/Illyricum/Macedonia and better positioned travel-wise to receive Levantine input. This is especially so for Campania, Calabria and Puglia. Thus, more Levantine affinity would make sense. Roman age flow into Balkan provinces north of Thessaly would have been almost exclusively comprised of Greek speakers from Anatolia. Not sure about Peloponnese or Greece, though, since it had good maritime access. Btw, Albanians take Slav_Czech in the 20% range in most of my models. That's considerable but not inconsistent with their culture, lexicon, tons of Slavic toponyms, Y-markers, etc. "Roman age flow into Balkan provinces north of Thessaly would have been almost exclusively comprised of Greek speakers from Anatolia. Not sure about Peloponnese or Greece, though, since it had good maritime access." I agree with that, further Near Eastern influx into the Balkans (and I do think there might have been some compared to even the ancient higher Caucasus samples, at least in the more southern and eastern areas - the Greek and Bulgarian samples compared to the rest for example) seems to prefer more northerly NE sources. Anatolia is a good bet considering the ties. The more southern parts of the Aegean, especially Crete which spent some time under direct Saracen rule too as we know, seem to have higher Levantine(/North African)-like affinities. I think the later (or different, considering that hell, Sicily had Phoenician colonies in its West end while having Greek colonies in its East) post ancient Caucasus-heavy influx, or at least *part* of it, to Italy came from more southerly sources than Anatolia considering it seems to prefer Levant over Caucasus. I think that everything south of Tuscany has very clear increased Levant_N-like affinities, beyond the ancient samples we currently have, that eats a chunk of the local Neolithic while looking similar to it. "Btw, Albanians take Slav_Czech in the 20% range in most of my models. That's considerable but not inconsistent with their culture, lexicon, tons of Slavic toponyms, Y-markers, etc. " For sure, I think we actually had a discussion on this issue a good while ago. I ran quite a few models for all Balkanites with Baltic_BA and Slav_Bohemia as proxies for early Slavic ancestry alongside ancient Balkan genomes, some near eastern stuff etc. and Albanians came out as 6.2-43 Slavic-like. The average of the two extreme values being 24.6 and the best fits also get something similar, actually a bit less. Greeks came out as 3.4-37, average of range 20.2 and close to what they get with the best fits, but the Greek sample also includes some islanders - on average mainland Greeks do seem to have higher Slavic admixture compared to Albanians. The rest of the Balkans gets much higher values in that sort of ancestry (the averages being something like 40%, though somewhat less with best fits). The obvious very serious limitations (beyond the inherent limitations of nMonte modelling but we on the very amateur side must make do) being that likely neither Baltic_BA (too extreme, way beyond even modern Balts) nor Slav_Bohemia (the most genetically "western" of the three early Slavic samples we have compared to the other two more Baltic-like ones that was high quality enough for David to include) are perfect proxies and that we don't *exactly* know how admixed the group coming in and the groups already there were. But the current fits are good nonetheless, especially with Baltic_BA so maybe a basic model of Balkan + Slavic + some Near East for certain parts will turn out to work ok.
David, I think the new van de Loosdrecht et al. (2008) Ibero-Maurasian aDNA study is worth a separate post on its own. The Europe Neolithic certainly has a kind of "Natufian" component (i.e. Stuttgart LBK), and this kind of North African "Ibero-Maurasian" component may well turn up in Mesolithic or Early Neolithic Iberia. Do we see any sign of it now in the Early Neolithic Iberians? Along with the new Early Neolithic Iberians from Valdosera et al. (2018), we also have the sample from El Torcal de Antiquera (El Toro), although the raw data there may not yet be available. Not all of the "Mozabite-like" component in Southern Europe may be recent (from the Carthaginians onward). Some LBK samples share a high-level of IBD with the Neolithic Iberians. Some of this "Natufian-like" component in the LBK might be coming directly from North Africa. By the way, what are the most reliable Y-haplogroup calls for the 55 Eurasian samples, and is there any way to work out which periods they're from?